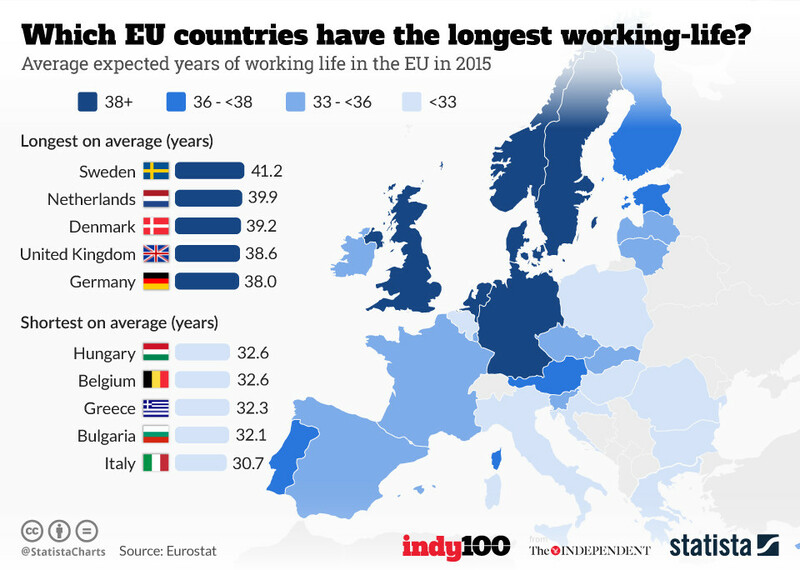 Scooper - Technology News: Which Europeans have the longest working lives? The Italian lifestyle is the envy of many. The food, the climate, and other aspects of la dolce vita have given the country the world's healthiest people . As if that wasn't enough, data from Eurostat shows that Italians have the EU's shortest working lives -- an average of just 30.7 years. The industrious Swedes, by contrast, clock up another decade at 41.2 years. Their neighbours across the North Sea in the Netherlands, Denmark, Britain and Germany have similarly long working lives. Across Europe, people are spending more years working than in the past. In 2015, Europeans worked on average 1.9 years longer than they had just a decade before. People in Malta saw their average working life increase by 5.1 years between 2005 and 2015. But given that they can still expect to work for just 33.4 years, it’s unlikely many of their friends further north will feel too sorry for them. Of course, just because Swedes have the longest working lives, it doesn’t mean they’re chained to their office desks. While 13% of employees in OECD countries work more than 50 hours a week, only 1% of Swedes do . Sweden is also well-known for its family-friendly work policies, such as generous maternity and paternity leave and shorter than average working days . Perhaps it’s thanks to their appreciation of work-life balance that they’re able to stick at it for so many years longer.